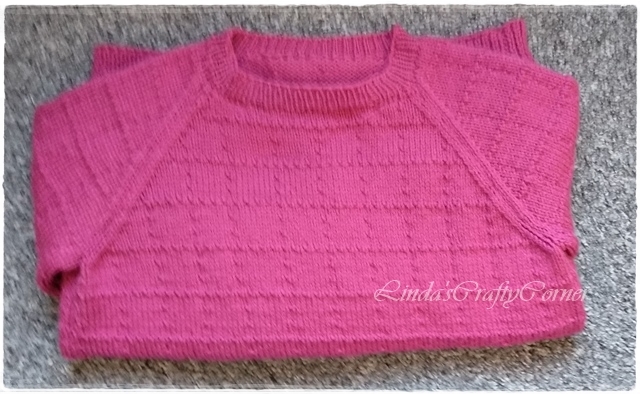 .Linda's Crafty Corner: A Sweater is Born. I finished making this sweater a couple of weeks ago and since then have actually worn it twice yay! If you can remember it was this one here which I started making a few months ago. This is the second sweater I have made for myself that I actually like enough to wear, the first was this one. I hated it when it was finished and had to make a few tweaks to make it acceptable for me to wear, the rolled design at the neck and at the start of the sweater which looked great on the model didn't suit me at all, it looked like a fat sausage wrapped around my hips 😂 and I just hated the neckline. To make it wearable I did a running stitch around the bottom of the sweater to catch the stitches and then with bated breath I cut the roll off, I then picked up the stitches and ribbed the bottom. For the neck I frogged the rolled neck and picked up stitches around the neck edge and ribbed there too. It was quite fiddly and to be honest I wasn't sure if I was spoiling it altogether but I was pleased with the result at least I have something I can wear. 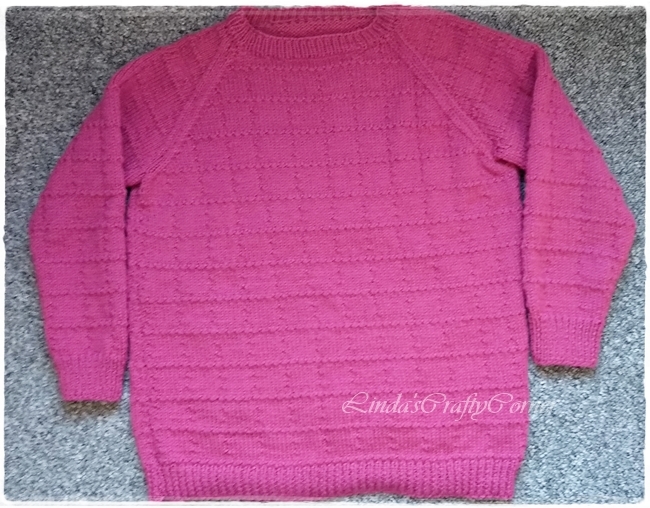 This sweater was made with Stylecraft Special Aran in shade Raspberry and it took 500 grams. It's very sloppy, soft, cosy and warm to be worn on extra cold days. If you can remember I told you I was crocheting a sweater too, that too is finished but I don't think I'll be wearing it, more about that one later. See all the great parties I will be linking to in my right side-bar. 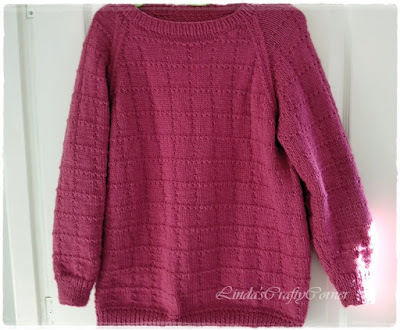 I love how pretty your sweater looks that you made Linda. I know you will get a lot of use out of it. It's lovely, Linda! The color is beautiful! I too was not pleased with the cardigan that I crocheted for myself and frogged it. Now it has been turned into a pullover and I like it. Well done !!!! Perfect for cold days ! Have a cosy weekend ! It looks fabulous and nice and cosy for the cold days we've got at the moment, finished just at the right time. You are brave doing those alterations. But it has turned out lovely, and I just took a look at your other link. That jumper looks gorgeous as well. I like all your colour choices. I love both your sweaters, the striped ones and those in pretty pink. It is beautiful, the color and pattern are just perfect. Glad you are enjoying it. This looks great. I love sloppy soft sweaters. haha. Cant wait to hear about the crochet sweater. I havent worn the one I made yet. I still feel like its just too heavy right now. It might be something good to wear when or if it ever gets reallly cold here. It's lovely. You made me laugh with the sausage round my neck comment! I'm the same, I can't bear anything bulky up round my neck. You were brave cutting into your newly finished knit but it obviously worked! It looks great, although I am sure you haven't been wearing it much the last few days. That was very brave to cut your knitting - scary. Thanks for joining in my Ginx Woolly Linx Party for February. Hello and welcome. I am a mum of 4 grown up children and I live in the North East of England. 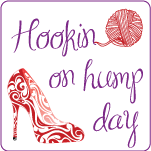 I am hooked on crochet and love all things crafty, please come in and make yourself at home. 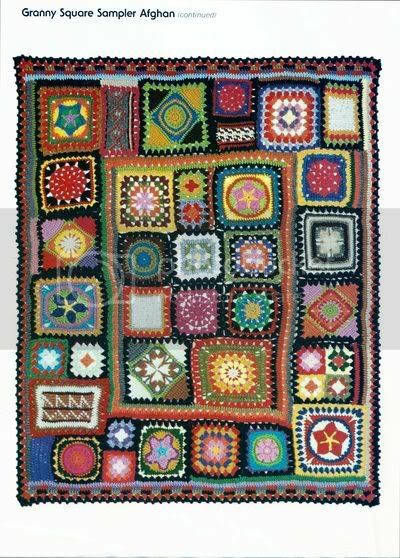 Little Treasure Baby Blanket Pattern. Yarn Chicken, Doilies and Spring. You are welcome to use any content from this blog as long as you link back to its original source. Please do not use any part of the content and claim it as your own. © 2012 - 1018 Linda Solaiman.